Hi Everyone! 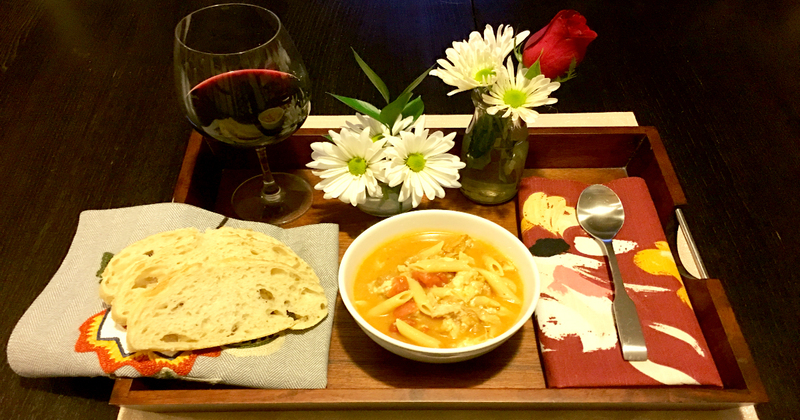 We had another COLD snap in Minnesota this past week, so Andy & I decided it was time for some homemade soup! We found some recipes online and created our own spin on Chicken Parmesan Soup. It was AMAZING and it gave us enough leftovers for two more days! So, if you’re in the mood for something warm, cheesy, and delicious, check out our recipe below! Bake chicken tenders according to package instructions. Allow to cool & then cut into 1" size pieces. Add canned tomatoes and chicken broth & bring to a simmer. Add penne paste and cook until al dente, 10-12 minutes. Add pre-cut chicken strip pieces, and mozzarella. Let cheese melt and then add salt & pepper to taste. If desired, add more cheese on top when serving. For a hearty twist, try serving your soup in a warm bread-bowl!